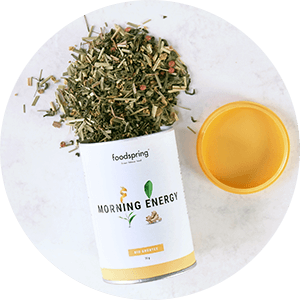 Click the button below to add the FOODSPRING FUNCTIONAL TEA SET to your wish list. THE BEST TEA FOR ALL DAY LONG. Get each morning off to a good start. Make every day your feel-good day. 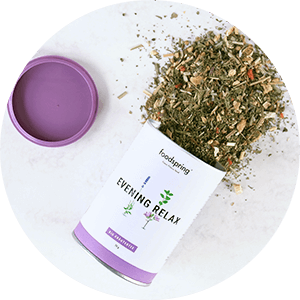 Then relax in the evening with a cuppa and sleep better than ever before. 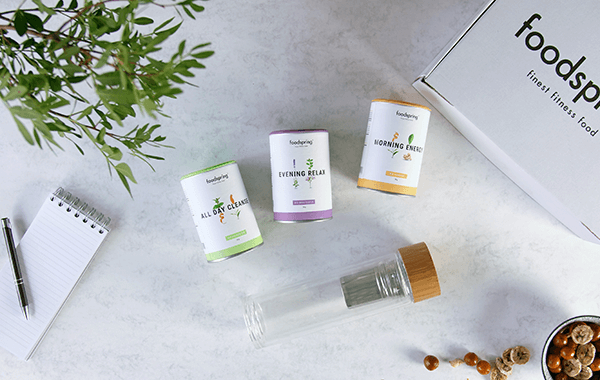 This set contains our three favourite teas that will guide you through your whole day. It also includes a thermal tea bottle, made of real borosilicate glass, so you don't have to go without your tea when you’re on the move. Keeps your tea warm. And cold. As you like it. High-quality tea bottle for maximum enjoyment on the go. GIVE THE GIFT OF PURE INDULGENCE. For your neighbours. Best friends. Family. Or even just for yourself. The best organic tea leaves together with a beautiful and practical tea bottle. This set is the perfect gift for anyone who loves to drink tea. For those who like to have tea on the go. But still also want to look good doing it. WHY WE DON'T RATE FLAVOURED TEAS. 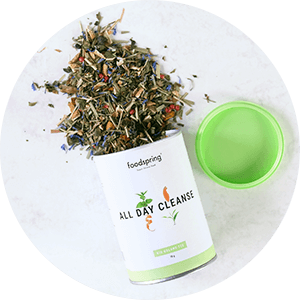 Our teas combine only the best ingredients that will not only benefit your body, but will also be pleasant on the taste buds. Additional flavourings? We don't use any of those. Nature provides all of the most delicious ingredients. Premium compositions that let your body and soul combine to take on any challenge with ease. An absolute highlight: Our thermal tea bottle, which allows you to have tea on hand wherever you go. FOR PREMIUM QUALITY AND THE BEST FLAVOUR - WHEREVER YOU MAY BE. Matured under the protection of the mountains. Our green tea is cultivated in the foggy fields in the Chinese province of Zhejiang. Our oolong tea is one of the best of its kind. Matured in the mountain valleys of northern Thailand. Made of heat and cold-resistant borosilicate glass. Keeps your tea warm or cold. And will not leak. The relaxation duo Grown in the warm sun, made for a peaceful night. Each of our teas is hand-selected and sorted with the utmost care. We only use high-quality organic ingredients for our teas. Their premium quality and gentle processing ensure that each individual ingredient can develop its own full, unadulterated flavour. 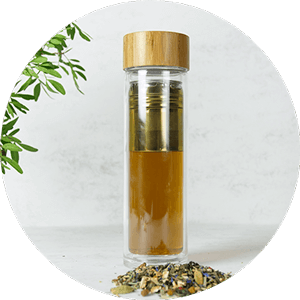 Our tea bottle, made of borosilicate glass and topped with a real bamboo wood lid, will allow you to enjoy your tea in style.